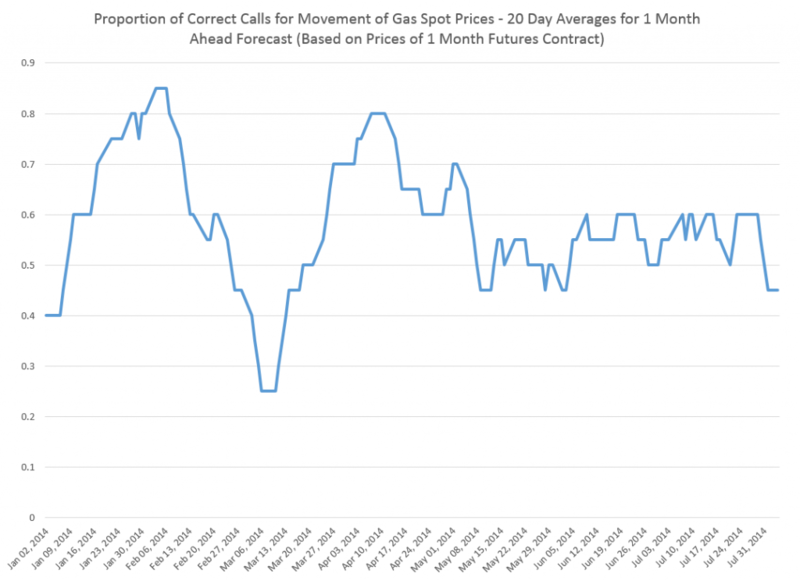 Do Oil and Gas Futures Forecast Oil and Gas Spot Prices? I’m looking at evidence that oil and gas futures are useful in forecasting future prices. This is an important for reasons ranging from investment guidance to policy analysis (assessing the role of speculators in influencing current market prices). So – what are futures contracts, where are they traded, and where do you find out about them? A futures contract (long position) is an agreement to buy an amount of a commodity (oil or gas) at a specified price at the expiration of the contract. The seller (the party with a short position) agrees to sell the underlying commodity to the buyer at expiration at the fixed sales price. Futures contracts can be traded many times prior to the expiration date. At the expiration of the contract, if the price of the contract is below the market or spot price at that time, the buyer makes money. Futures contracts also can be used to lock in prices, and hedge risk. The New York Mercantile Exchange (NYMEX) maintains futures markets for oil and gas. Natural gas futures are based on delivery at the Henry Hub, Louisiana, a major crossroads for natural gas pipelines. So there are futures contracts for 1 month, 2 month, and so forth, delivery dates. As noted by Menzie Chinn, a popular idea is that the futures price is the optimal forecast of the spot price is an implication of the efficient market hypothesis. Nevertheless, the evidence for futures prices being unbiased estimators of future spot prices is mixed, despite widespread acceptance of the idea in central banks and the International Monetary Fund (IMF). some evidence that the price of oil futures has additional predictive content compared with the current spot price at the 12-month horizon; the magnitude of the reduction in mean-squared prediction error (MSPE) is modest even at the 12-month horizon, however, and there are indications that this result is sensitive to fairly small changes in the sample period and in the forecast horizon. There is no evidence of significant forecast accuracy gains at shorter horizons, and at the long horizons of interest to policymakers, oil futures prices are clearly inferior to the no-change forecast. Both Chinn and the Forecasting the Price of Oil chapter in the Handbook of Forecasting are good places for readers to check the extensive literature on this topic. Forecasting is about computation and calculation, working with real data. So I downloaded the Contract1 daily futures prices from the US EIA, a source which also provides the Henry Hub spot prices. Natural gas contracts, for example, expire three business days prior to the first calendar day of the delivery month. Thus, the delivery month for Contract 1 in the US EIA tables is the calendar month following the trade date. Here is a chart from the spreadsheet I developed. I compared the daily spot prices and 1 month futures contract prices by date to see how often the futures prices correctly indicate the direction of change of the spot price at the settlement or delivery date, three days prior to the first calendar day of the delivery month. So, the April 14, 2014 spot price was $4.64 and the Contract1 futures closing price for that day was $4.56, indicating that the spot price in late May would be lower than the current spot price. In fact, the May 27th spot price was $4.56. So, in this case, not only was the predicted direction of change correct, but also the point estimate of the future spot price. The chart above averages the performance of these daily forecasts of the future direction of spot prices over rolling 20 trading day windows. From January through the end of September 2014, these averages score better than 50:50 about 71 percent of the time. I have not calculated how accurate these one month natural gas futures are per se, but my guess is that the accuracies would be close. However, clearly, a “no-change forecast” is incapable of indicating the future direction of changes in the gas spot price. So the above chart and the associated information structure are potentially useful regardless of the point forecast accuracy. My explorations suggest additional information about direction and, possibly, even turning points in price, can be extracted from longer range gas futures contracts.